Private beach and dock. Lake front home with beautiful landscaping. Meandering stone path to beach. Beautiful landscaping. Payette Lake Palace. The name says it all. Large, circular driveway. 4-wheel drive required during winter. Payette Lake - view from living room deck. Welcome. Garage entry from stairs at right. Amazing views. Wood burning fireplace and stone hearth. Master suite is located on upper level and has a lake view. Not a bad seat in the house. Floor to ceiling views of Payette Lake and Payette National forest. Chef`s kitchen. Well equipped with ample work space. Kitchen is well lit. Counter seating for six. Formal dining area. Relax in comfort. Large dining table and counter seating to accommodate all of your guests. Guest bathroom located off of foyer. Living room has deck access. Summer, deck furnishings to accommodate everyone. Master Suite is located in the deep loft on upper level. King size bed, TV, attached master bath. Attached, master bathroom. Walk in shower with stone tile and glass blocks. Elegant design features. Dedicated work space in master suite and on lower level. Beautiful view. Bright and extra wide stairwell to lower level. Access deck, hot tub and beach path from lower level lounge. Guest bedroom 1 with queen bed located on lower level. Lounge has propane stove, big screen TV and work space. Dedicated work space on lower level. Guest bedroom 2 has a full over full size bunk set. Hall access bathroom on lower level. Guest bedroom 3 has two twin beds. Hot tub pergola has lake view. Front door upper and lower deck access is covered and out of the weather. Beach level view. Garage parking to keep out of the weather. Live and play outdoors at this magnificent lakefront home with private dock and 105’ of Payette Lake frontage. Make your way to the lake through a beautifully crafted landscape enhanced with comfortable, meandering split boulder pathways punctuated by stone patios for lounging or dining. Truly soak your cares aware in the large hot tub nestled beneath a private, post and beam pergola adjacent to house and covered breezeway for easy, out of the weather access. Relax on either of two, expansive decks with furnishings for lounging while enjoying a beautiful view across Payette Lake to her eastern shoreline framed by the Payette National Forest. Plenty of space indoors and out crafted especially to create petite, private retreats is the magic of this elegant mountain home. Accommodate up to 10 guests in comfort. This three level, 4 bedroom and 3 baths home has a kitchen well outfitted for entertaining and preparing a special meal for family and friends on the main level as well as a formal dining space for guests and counter seating for more casual fare. Take the chill off on alpine mornings and winter days while enjoying the warmth and ambience of a wood burning fireplace. The great room has a stone hearth, floor to vaulted ceiling windows and beautiful, lake view. Upper level has large Master Suite Loft with King bed, attached bath, and walk-in shower. Daydream and enjoy the lake view from the dedicated, loft work space. Gather the family in the downstairs lounge. Bring the popcorn and watch your favorite movie on the big screen TV. There are three bedrooms on this level that include a full over full bunk set, two adjacent twin beds and a lake view bedroom with a Queen bed. There is lower deck access from lounge and access to beach path as well. Great, west shore location near Green Gate snowmobile park and minutes from Bear Basin Nordic ski area and less than 30 minutes to Brundage Mtn. Lifts. 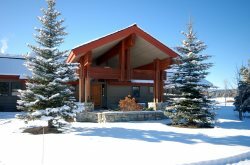 Quiet and peaceful neighborhood within ten minutes from downtown McCall. This home has a two night minimum stay. Some date ranges require a 3 or 4 night stay. Refer to rates page for specific length of stay requirements. Your worry free, DoneRight Management Vacation Rental is equipped with linens, bath towels and essentials that include guest soaps, shampoo/conditioner and hair dryer as well as Kitchen essentials and towels. To start your vacation off right, we’ve provided a days worth of supplies including your morning coffee, paper towels, bathroom tissue, and garbage bags. Also provided where required is propane for gas grills, and enough wood for fireplace use during your stay. For properties with a fire pit, you can purchase wood at several local stores. Our little guests are important too, most homes include a pack n’play, high chair, booster seat and baby gate. Make yourself at home but please be respectful of locked cupboards and doors that indicate a private space. Large, circular drive requires 4-wheel drive during winter months.